It is finally great to be back participating in the Recipe Redux. I had to take a hiatus while I was on bedrest and then had my little girl 10 weeks ago. This month’s Recipe Redux challenge was to use natural sweeteners, either honey or maple syrup, in a recipe. This was a tough choice for me as I love both. Maple syrup is something I use often in marinades, particularly with pork dishes where it provides the perfect sweet balance and flavor for the meat. I also love maple syrup on pancakes or waffles. But my love for honey is beyond compare. I grew up drizzling honey on perfectly thin and crunchy toast out of my grandmother’s oven. Whenever I would visit her, I would find toast in her broiler and honey on the countertop. It was also always on her breakfast table, and I enjoyed many a breakfast with her on a sunny porch eating honey and toast alongside my soft-boiled eggs. Honey is also the perfect complement to a cup of tea for me, though in moderation. I love honey so it would be impossible for me not to use it in a recipe. I was also fortunate enough to get one of the last jars of honey from a neighbor whose father raises honey bees locally. I believe it can have anti-allergenic properties and I know so far this spring with record high pollen counts in Atlanta I’ve been just fine. At least that is my excuse for eating honey every day. But I do watch my portion sizes. No matter which of nature’s sweeteners you choose, they both still have similar number of calories and can add to the waistline if eaten in excess. I have always loved making my own bread. I broke down and bought a bread machine years ago and haven’t looked back since. While I occasionally make a loaf by hand – there is something therapeutic about kneading – you cannot beat the convenience of a bread machine. Lately I have been using my bread machine several times a week. 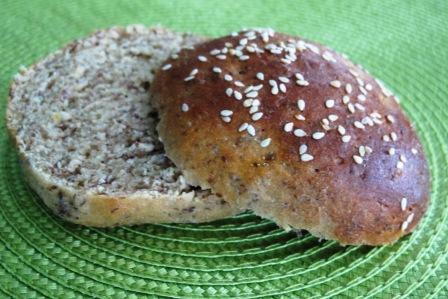 I found this recipe for Whole Wheat Hamburger Buns a while back that really wasn’t whole wheat and I have been tweaking it and perfecting it for a while now. Here is my version, which is truly whole wheat. You can make hamburger buns or hot dog buns easily with the recipe. 1. Place all ingredients in the bread machine in the order listed above or according to manufacturer instructions. Set the machine to the Dough cycle. 2. Once dough cycle is finished, remove dough from machine and place on a clean counter, dusted with flour. Roll out dough into a 12 inch long rope. Using a serrated knife, cut the dough into 8 pieces for sandwich buns. You could also cut into 12 pieces for hot dog buns or for slider-sized buns. 3. Roll each piece into a ball for sandwich buns or into a 6 inch roll for hot dog buns. Place on a greased baking sheet and flatten. If desired, beat egg white until it turns white and frothy. 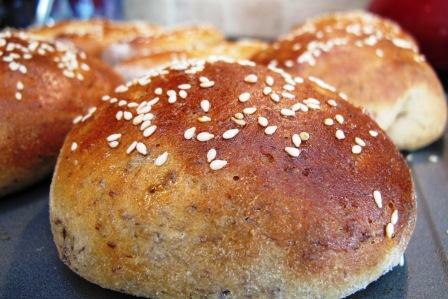 Brush egg white on each bun and sprinkle with sesame seeds. 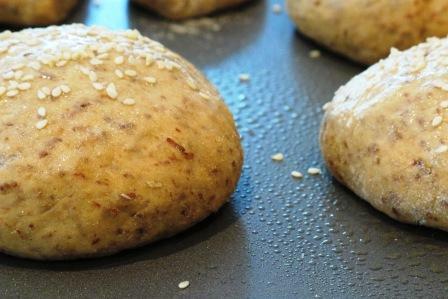 Cover buns and allow to rise for 10-15 minutes in a warm, draft-free place until almost doubled in size. 4. Bake buns in a preheated 400 degree F oven for 10-12 minutes or until golden brown. Cool completely on a wire rack and then slice horizontally. Enjoy with sandwiches, your favorite burger or uncured nitrate/nitrite-free hot dogs!